Easy huh? The person who buys your product. Doh. Possibly there is more to it. What if you use a distribution channel like a Reseller (in IT lingo) or a supermarket, Cash and Carry, corner store etc? Take Heinz Baked Beans – a staple in our home – for example. There are the packaging and raw materials suppliers (they must buy tons of beans – geddit?) to Heinz, the supermarkets and wholesalers that Heinz supplies, the smaller shop-keeps that buy from the wholesaler and the likes of you and me that buy from the supermarkets, corner stores and CostCo‘s of this world. Suddenly there are many more customers in the equation as money is changing hands between a host of parties. However, not all are buying Heinz Baked Beans in the same way. Heinz itself is buying the raw materials to make the beans so as the product originator we can move their eligibility to one side. That leads the others in the supply chain. I’d argue that resellers are buying more of a commodity item as they are buying beans in bulk to meet consumer (that’s you and me again) demand. The consumer is the one choosing the Heinz brand over – for example, Crosse and Blackwell – other baked bean brands. Although our money makes it to Heinz some of the amount is kept by the suppliers in the chain.Except, hang on a moment here, the resellers are specifying Heinz and not generic beans. Can they buy Heinz from more than one source? Now there is a competitive marketplace that isn’t seen by the general public. Although Heinz doesn’t sell to the consumer we are the one of the many customers. Look at where the marketing is directed. 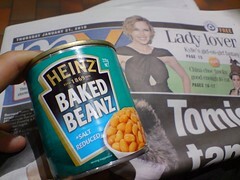 The consumer is sold the “Beanz Meanz Heinz” concept and the retailer fulfils our demand. This is the entire thing simplified. All pretty convoluted eh? Nonetheless, I’d contend that there are many customers involved and their needs are often totally different. I want 1 can for my lunch and Sainsburys want 100,000 cans for stores dotted all over the land. What this means is that customers can be directly “related” to you – me and Sainsburys – or removed several times – me and H.J. Heinz – but they are customers nonetheless. The real lesson is in understanding that “the customer” is often not just someone involved in a direct relationship with the manufacturer. Think about this before making assumptions about who “the customer” really is. ’nuff of this talk. I have some cold beans (Heinz, obviously) and sausages in the fridge. Nom nom.